Consumers now, more than ever, have a heightened awareness of sustainably and ethically sourced products. The GIA Diamond Origin Report uses scientific evaluation to provide confirmation of a diamond’s geographic origin. Origin information for a diamond helps you distinguish between natural and laboratory-grown diamonds and deliver a strong message on the good mined diamonds do for the country they come from. Proof of a diamond’s origin provides the peace-of-mind a consumer needs before they purchase and you can use this origin information as a way to build trust and credibility with your customers. Additional materials are available to tell the story of the diamond’s origin*. 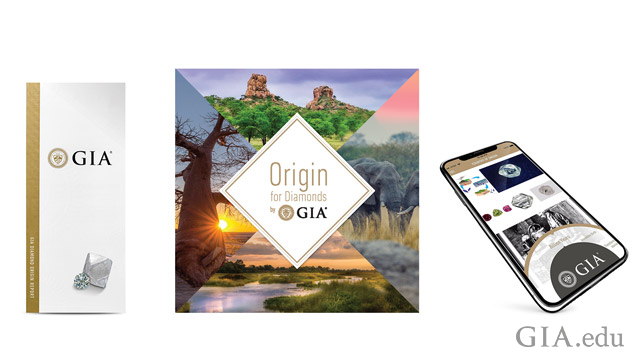 A book and an app include information about diamond formation, discovery and mining, polishing and grading, and the beneficial impact of diamonds in that country. The app also includes report data and images of the rough and polished diamond. Marketing materials for this service will be available through the Retailer Support Program at retailer.GIA.edu at launch. As the world leader in gemological research, GIA is uniquely able to leverage over 60 years of scientific research, knowledge and technology to deliver the rough-to-polish matching confirmation for polished stones. GIA will collect data and images for rough analysis. Once GIA receives the polished diamond, GIA uses markers and data identified during the analysis of the rough to scientifically match the polished diamond to its original rough, confirming the diamond’s country of origin and bringing added transparency to the natural diamond supply chain. *All book, app and marketing content subject to change. View all additional services available for D-to-Z diamonds. View fees by gemstone and currency. Manage your GIA account online with My Laboratory. It’s free for any current laboratory client with an email address.